Moving to a new country as an international student can be a daunting experience. For Trang Le, it was even more challenging as she travelled from Vietnam with her mother and nine month old daughter in tow. 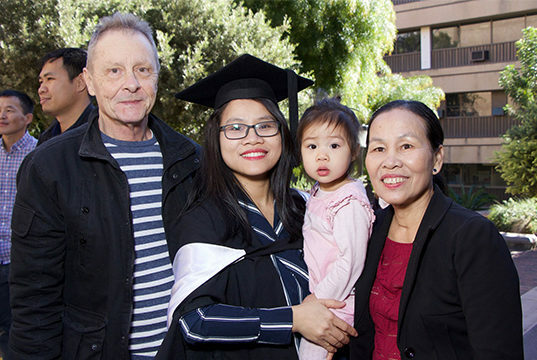 “It was a really difficult time for me,” said Trang, who came to Adelaide to study her Masters in International Trade and Development. “However, I was lucky to have the Experience Adelaide program where I met Peter,” she said. The program pairs an international student with a volunteer who introduces the student to life in Adelaide to help them feel more integrated in the community. Peter began volunteering with the Experience Adelaide program in 2017, wanting to do something useful in his retirement. Keeping Trang’s family situation in mind, Peter organised child-friendly outings across Adelaide every fortnight. They enjoyed many playgrounds, beaches and trips to Victor Harbor and the Barossa. “We were introduced to Adelaide culture and saw many beautiful places out sightseeing,” said Trang. But it was the sense of family they both experienced that really cemented their connection. “Peter treated us like his family. He often asked about my study and how I was adapting to the new environment and encouraged and motivated me. He helped me and my family with everything we needed and much more,” said Trang. Peter enjoyed learning about Trang’s culture and meeting new people through Trang, with many of her classmates coming along to their outings. Trang has now moved back to Vietnam where she is working for the Vietnam Chamber of Commerce and Industry, but she stays in touch with Peter regularly via email. She credits the Experience Adelaide program and Peter with making her time in Adelaide so enjoyable. This entry was posted in Alumni eNews, Alumni Profiles and tagged alumni, Experience adelaide, international student, University of Adelaide. Bookmark the permalink.